When the time comes to bathe your cat, be prepared with the best cat shampoo on the market. Your cat’s shampoo should be the least stressful part of bathtime. Choosing the right product will ensure that your cat concludes their bath with a clean coat, hydrated skin, and no worries about toxicity or irritation later. In this article, we’ll explore the reasons to bathe your cat, how to choose the best cat shampoo, and which shampoo products are ideal for unique feline situations. Your cat’s coat is stained with something toxic or unpleasant. This could happen when your cat wanders into the garage and brushes against a dirty bottle of motor oil, rolls in dirt, or was in the wrong place when someone spilled nacho cheese. Any time that your cat gets in a messy situation with something they shouldn’t lick off, it’s a good idea to give them a bath. Your cat has itchy skin. If you choose the right cat shampoo, bathing can help to treat your cat’s skin discomfort. Your cat has a flea infestation. Bathing your cat, even with a non-medicated shampoo, can help to manage the discomfort associated with a flea infestation. Your cat doesn’t groom well. Some cats, especially seniors and overweight cats with limited mobility, don’t groom themselves very well. This can result in dandruff and grease buildup. A bath can help these cats to stay fresh. Your cat is headed to a cat show. It’s standard for show cats to have a good bath shortly before the competition. Your cat is a hairless breed. Just like humans, breeds like the Sphynx and Bambino require regular baths. If hairless breeds aren’t regularly bathed, natural oils will accumulate on their skin. Someone in your household is allergic to cat dander. While it’s not an absolute solution to cat allergies, bathing your cat every couple of weeks can cut back on the amount of dander they distribute around the house. 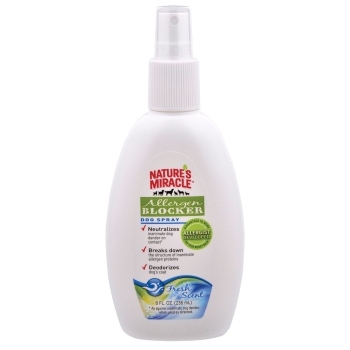 Some shampoos are made with special allergen blockers for additional fighting power. What makes a cat shampoo great? When bathing your cat, it’s important to use the right cleaning products – and you won’t find those in the hair care department at the grocery store. 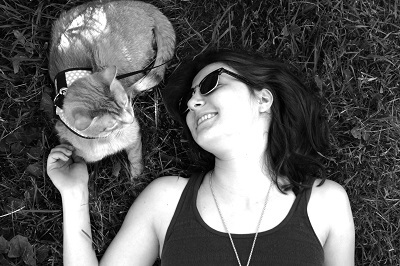 Your cat’s skin is thin, delicate, and less acidic than yours. It’s very sensitive and could be irritated by most human shampoo products. Remember that your cat will lick themselves after a bath, ingesting any residue lingering on their body. Human shampoo is usually full of toxic ingredients that could make your cat sick. It’s important to choose a good cat shampoo that was formulated for your cat’s pH balance, skin sensitivity, and grooming habits. Note: if your cat is in need of immediate cleaning and you don’t have cat shampoo on hand, you can use a small amount of gentle dish soap or tearless baby shampoo instead. The best cat shampoo has a gentle, non-irritating formula. The best cat shampoo is free from ingredients that could irritate your cat’s skin or make them sick when they groom themselves later. It’s always a good idea to seek out gentle, straightforward formulas featuring vegetable-based cleansers. The best cat shampoo is appropriate for your cat’s unique needs. Just as the human shampoo aisle is packed with formulas for thin hair, heat-processed hair, curly hair, red hair, silver hair, and dyed hair, each cat shampoo formula is slightly different and not every one is appropriate for every cat. In the following list of the best cat shampoo, we’ll address several unique situations and the shampoo that’s right for them. 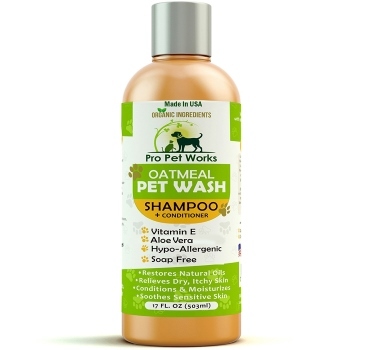 This cat shampoo receives consistently positive reviews and is one of the most widely-recommended products on the market. It’s free from all of those things people tend to avoid – no sulfates, no parabens, no dyes, and no artificial fragrances. Because it’s free from these potentially irritating ingredients, this formula is good for most allergic cats, as well as those with respiratory issues and other sensitivities. This shampoo is made with purified water, extra-mild renewable coconut-based cleansers, aloe vera, xanthan gum, and olive oil squalene, a natural substance used as a preservative. All of these nourishing ingredients are gentle on your cat’s skin. This is a strong candidate for your all-purpose cat shampoo, ready for dirt, grime, fleas, and anything else that demands a cat bath. This soothing conditioning shampoo was formulated for sensitive skin, featuring a blend of natural oatmeal, palm and aloe vera, along with other vitamins, minerals, and oils that help to clean and nourish your cat’s coat. 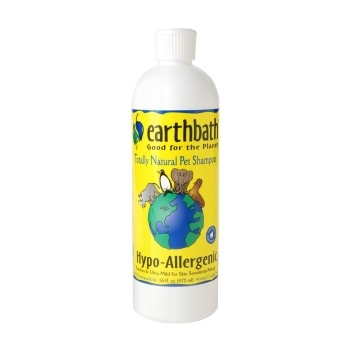 It’s hypoallergenic, making it appropriate for cats with irritated skin caused by allergies. The ingredient list is on the vague side, saying that the shampoo contains water, plant-based surfactants derived from coconut and palm, oatmeal & aloe extract, fragrance, and a nameless preservative. Although it’s not as popular among cats as it is with dogs, the formula is safe for cats and customers say that it works well, leaving their cats clean and smelling fresh. It also gives them a soft, shiny coat. This gentle product both cleans and conditions your cat’s coat, yielding soft, shiny fur and skin that’s less prone to itching. 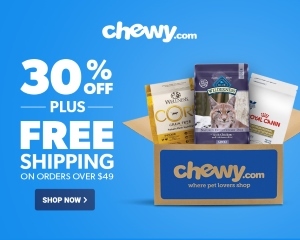 The company explains that the shampoo was specially formulated for pets with grass, food, and flea bite allergies. 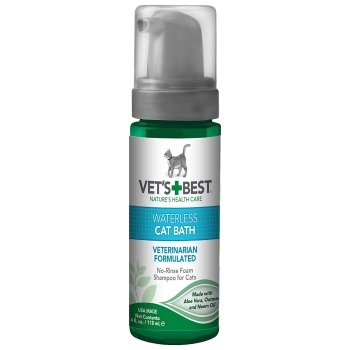 The soothing formula can help to moisturize your cat’s dry skin and minimize dandruff. It’s made from water, a coconut shampoo base, aloe vera extract, almond oil, hydrolyzed oat proteins, vitamins A, D, and E, glycerin, glyceryl stearate, wheat germ glycerides, blend of cherry botanical extracts, EGDA ( a conditioner), EDTA (a blending agent), and a proprietary blend of skin conditioners and moisturizers. This highly-moisturizing shampoo has the ability to control scaling and flaking associated with seborrhea, the skin condition that most often causes dandruff. It’s formulated with water, sodium C14-16 olefin sulfonate (a foaming agent), cocamidopropyl betaine (a surfactant), sodium lactate, PEG-150 (an emulsifier and thickener), PEG-75 (an emulsifier and skin lubricant), glycerin, hydrolyzed collagen, sodium chloride, fragrance, safflower oil, FD&C yellow #5, methylchloroisothiazolinone (a preservative), methylisothiazolinone (a preservative), and citric acid. It’s a highly-rated formula that’s particularly popular among Sphynx cats, who require regular bathing and need a moisturizing shampoo that will keep their skin healthy. Some of the ingredients in the shampoo can be irritating or allergenic, so you might not want to use it on particularly sensitive cats or those with broken skin. Note: this cat shampoo can help humans who are allergic to cats, not cats who are allergic. Allergic cats may require a different product, such as Pro Pet Works Natural Oatmeal Shampoo, reviewed earlier in this article. If you or someone in your home suffers from cat allergies, you might think about bathing your cat with an allergen blocking shampoo. This allergist-developed shampoo contains an enzymatic allergen blocker that can break down inanimate dander proteins on your cat’s coat. Remember, however, that dander is found in your cat’s saliva, so the shampoo is far from a permanent solution to your allergy problems. If you’re looking for an all-natural product, you might not like that this shampoo’s ingredient list is vague, containing a mild surfactant blend to clean the coat, conditioner to soften it, nameless preservatives, and added fragrance. If you’ve ever used a dry shampoo in your own hair, you’ll understand the ease and convenience of a cleaning product that you can spray on, rub in, and forget about. This waterless cat bath is a foam that you spray onto your cat, brush through their coat, and let dry. There’s no need to rinse this non-toxic product out of your cat’s fur. The ingredient list consists of neem oil, micronized oatmeal, vitamin E, aloe vera, panthenol (vitamin B-5), allantoin (a skin conditioner), and natural fragrance. While this shampoo might not work for serious messes, it’s a good choice for cats who need a little help to stay clean. 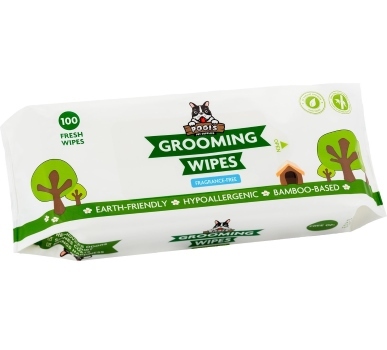 If your cat’s self-cleaning abilities have declined with age or if they tend to roll in the dust when they go outside, grooming wipes are a convenient daily solution. These moist wipes keep your cat clean and happily out of the bathtub. Each wipe is infused with aloe vera, vitamin E, and Hawaiian Awapuhi, which safely condition and clean your cat’s coat. The wipes are hypoallergenic and safe for use on cats. Once you have the best cat shampoo, it’s time to give your cat a bath. Here’s how to do it. In the following video, Dr. Karen Becker goes into depth on how to give your cat a bath without traumatizing them. First, prepare for the bath. As Dr. Becker suggests, use a pheromone spray to help your cat to stay calm during this potentially stressful experience. Since the pheromone spray may not be enough to sedate your cat into a blissful state of mind for their spa date, it’s a good idea to give them a manicure and pedicure in advance. This will help to protect you from scratches if your cat gets nervous during the bath. Set up your bathing area by laying a towel down in the sink or bathtub. This will give your kitty’s paws something to grip onto – slipping around in a wet tub will only make them more nervous. Gently moisten your cat and massage in the shampoo. Avoid dunking your cat in water and be sure to heat the water to a lukewarm temperature that won’t bother your sensitive cat. Use a sprayer or hose attachment to get your cat wet, then apply the shampoo and lightly massage it into your cat’s coat. Although you’re using a non-toxic cat shampoo, it’s still important to rinse thoroughly to ensure that no residue remains on your cat’s coat. Ensure that your cat gets warm and dry as soon as possible. Immediately after bathing, wrap your cat in a warm towel – who doesn’t love warm towels fresh out of the dryer? – and carefully dry them off as thoroughly as you can. If your cat finds this frustrating, it’s okay to allow them to find a warm place in the house where they can air dry. And don’t forget to give your cat a delicious treat after their bath – this helps to leave them with positive memories of the experience. If possible, don’t bathe your cat more than once a week. Even if you use a moisturizing shampoo, bathing strips the natural oils from your cat’s skin. 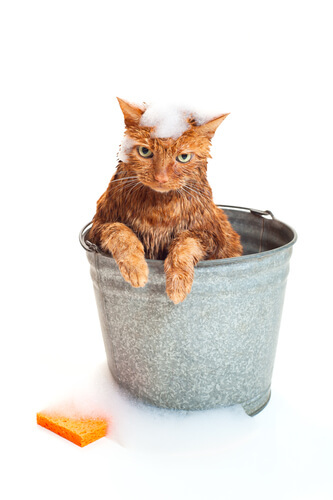 Too many baths can leave your cat dry and irritated.